I really do like my lawn mower. I don't have a huge lawn like some people so I don't really need the use of the riding kind and what not, which is why I love my mower and it really does good for me. It's not big or small, but it does the work just right.. It has a 4 horsepower engine and some people think that it’s kind of small for a engine, but I really do think that it works fine because all of my grass is actually grass and not anything that needs more power. The controls on the engine are really easy to use and last summer I had to get around to replacing the blade because it wasn’t cutting as nice as it originally had. I had no problem at all finding replacement blades and the store and actually going through the process of replacing the blade was actually pretty easy. It didn’t take that much strength. Also, I like the fact that the bag comes on and off because sometimes I want to collect the grass to dispose of and other times I just want it to go back into the grass so that it can be used as fertilizer. I wouldn’t really say that there are any problems with it because it’s a simple thing and I haven’t had any problems at all with the engine. I still haven’t had to replace the spark plug yet. I guess like most mowers, they don’t do a good job with the edges, so I always have to go around with a weed whacker to finish up those areas, but I think that no matter what lawn mower I had, I would have to do the same thing. 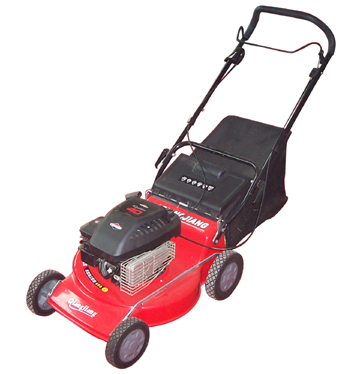 So, because of that I really do like my mower and I would really buy another Briggs and Stratton Mower in an instant.